We have our rainbow back – well most of it! It took refugees from Syria, Africa, America and Germany just one week to construct the first two elements of the Rainbow Playground. The whole thing was made possible thanks to many donations and the professional input from SIK-Holz, the company that makes the play equipment. Putting up the visible elements went really fast but it will take longer for the foundations to harden off (a couple of weeks). Please be patient. You will soon be able to play on the swing and slide here. We are looking forward to it too. We are continuing to collect donations so that we can reconstruct the entire rainbow. It still needs the slide, which is part of the eastern section and an ark – just in case there is a flood. Please donate whatever you can and share the link with your friends. Jens-Holger Kirchner, responsible for urban development with Pankow Council, the non-profit organisation Freunde des Mauerparks and SIK-Holzgestaltungs GmbH have found a solution that will make it possible to re-erect the Rainbow playground in Mauerpark before the end of July. The old playground was closed down in autumn 2015 for safety reasons and its rainbow dismantled. The foundations were suspected of being unstable. What is special about the new situation is that two very different kinds of group will be involved. One of the groups is Rainbow-Projects.de, headed up by its co-founder Rolf Martin, who is a church minister in Lübeck. The other group consists of refugees, young men living in emergency accommodation in Malmöerstrasse. 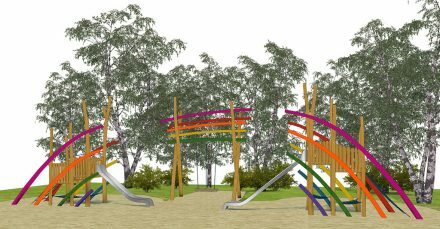 Everyone, including the Freunde des Mauerparks, will be giving their time voluntarily to replace the swing in the middle of the rainbow and the small circular element of the playground. 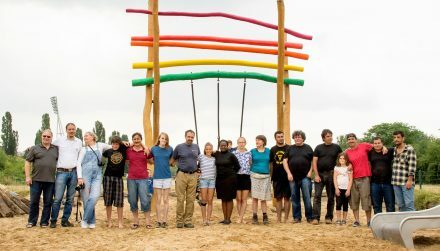 The Rainbow playgrounds are important as a symbol of reconciliation and there are many of them in different post-conflict countries around the world. The first was constructed in Soweto in 1998; “our” rainbow in Mauerpark was added in 1999 and stands where the Wall divided the boroughs of Pankow and Wedding in the former East and West Berlin. It has been possible to start re-creating the Rainbow playground because the Freunde des Mauerparks ran a successful campaign and raised sufficient funds and because SIK-Holzgestaltung is going to do the work free of charge. 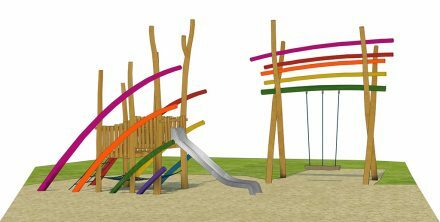 We need more funds to be able to fully recreate the lovely Rainbow playground so that the children can play there again in 2017. Since the autumn of 2015 we have marveled at the ruins of Mauerpark’s rainbow playground, and we have recounted extensively the circumstances of how this special symbol of the Park came to be dismantled. However, we have channeled the initial outrage over the playground’s destruction into our initiative to turn the end of the old rainbow into the beginning of a new one. Together with the project coordinators, the Parks Department, and the Citizen’s Workshop, we have advanced a plan for a new rainbow in Mauerpark. The concept for the new rainbow playground is finished, and the start of construction is almost within our reach. Now we need your support. Every rainbow has a pot of gold—usually at the end. However, in Mauerpark, the pot of gold is at the beginning. Our pot needs filling, and everyone can participate. Only through your donations is the construction of the rainbow playground possible. Please put a gold coin, a dollar, or a euro in the pot, and help Mauerpark’s dream of a rainbow come true once again.